Live music in Golden occurs all through the summer. Plan to visit Golden for a music festival or drop in on the musicians and bands scheduled to entertain you during the season. This weekend celebrate the beginning of summer at the annual Golden Music Festival on Friday, Saturday, and Sunday, June 12-14, 2015. 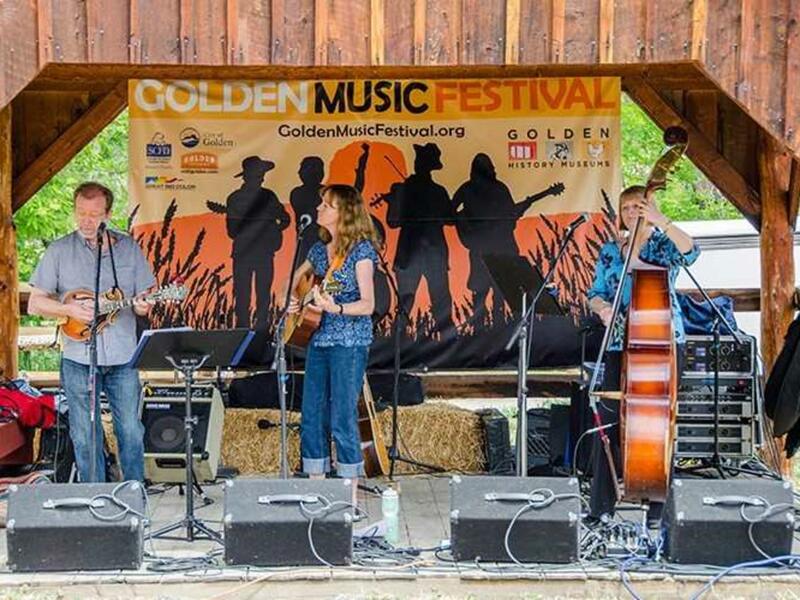 Bring a blanket and sit on the rustic hillside amphitheater in Golden’s Clear Creek History Park for one of the region’s top bluegrass festivals. Have you found the Golden Moon Speak? It’s the official after party location for the Golden Music Festival. Walk on over for more great music and of course, cocktails! The Buffalo Rose has fired up their outside patio for live music all summer long. Every Monday, Wednesday and Thursday (weather permitting) “The Rose” features live music on the patio. The Golden Hotel is featuring the Clear Creek Concert Series every Thursday night from 6 – 9 pm in June, July and August. Wrigley’s Chicago Bar & Grill has a full schedule of weekend music. Stop by for a pre-Red Rocks sound bite! And place the Mountain Melodies Music Festival on your calendar today! This is a free picnic concert in August and it will take place at Buffalo Bill Museum and Grave on August 2. Lots of fun family time at this one! Golden Summer Street Fairs, sponsored in July and August by the Golden Chamber of Commerce will feature live bands and beer and lots of room for dancing to the sweet sounds of summer. August is the month for live Music and Movies in the park, every Friday of the month.